Dr. James Childs (pictured), a pathologist and leading layman in the Grace Brethren Church of West Kittanning, Pennsylvania (Mark Cornwell, pastor) continues his rehabilitation from a horrendous 250-foot fall last April. 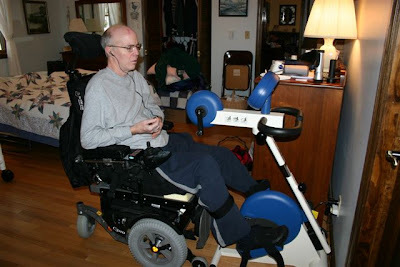 A recent update by his daughter, accompanied by this photo of Dr. Childs listening to scripture while exercising on a bike, said, “Jim uses the bike about an hour a day–just on his legs and then more on his arms. He can move the pedals about 90 percent on his own. Original reports of Dr. Childs’ accidents may be seen in this blog’s archives on April 7, 2007. Regular updates from his daughter are available on www.caringbridge.org/visit/jimchilds The family will continue to appreciate your prayers for Dr. Childs’ recovery, rehabilitation, and adjustment.